It’s a cliche but I can’t help but saying – man, time flies when you’re having fun. And boy did I have fun in May. Let’s take a quick peek at the photos that represent something I did/saw/loved each day. 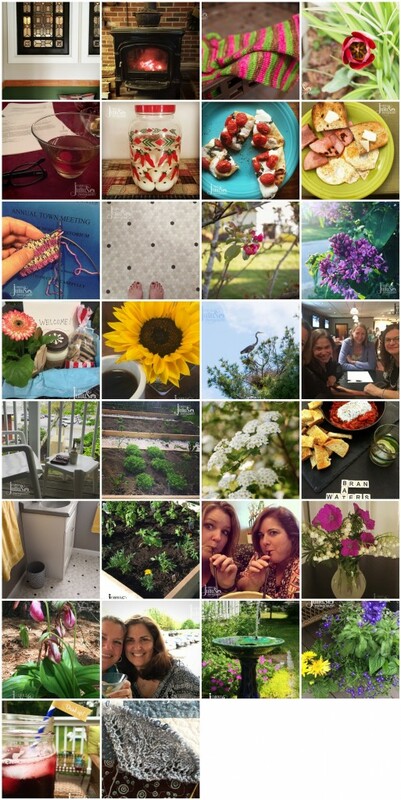 Friends and flowers, food and fun, conferences and meetings and some actual knitting, too. It was a very good month. June, though? June is my favorite month. My wedding anniversary is in June. Dale’s birthday is also in June. Plus, and it’s true for this year, we often take a vacation in June. Lots of good stuff behind me, as shown above, but lots of good stuff ahead and that’s what makes every day amazing. You’ve got tons of good stuff in May, as always. It’s funny seeing the wood stove, and I do love that solar bird bath fountain. I bet June will be even better! I love the diversity of your photos – from inside by the fire to outdoor fun all in one month! And, the flowers! Great photos, Carole! May looks like transition month….from a copy fire to glorious blooms! May went by in such a flash! I want to hold on to June. Love all the color in this months collage. Love the May photos! Spring is such an amazing time, and I agree June is the best!